Webbers Crossing | Master Planned Development, Manor/Austin, Texas -Jim assembled, acquired, planned and entitled this three tract project totaling 1,053 acres fronting along Gilleland Creek at its confluence with the Colorado River. Three different master plans were developed ranging from a single-family subdivision totaling nearly 3,500 homes, a senior housing residential and golf course community to a intense master planned urban village. The residential village development sections adjoin the mid-rise central core of a creative arts village that includes multiple film and music production studios, scoring and recording stages and office/hotel buildings. The village is populated with retail, restaurant and other shopping and service businesses designed to serve the 24 hour-7 days per week -365 days a year production industries. These properties are currently under contract for sale. Louetta Spring Plaza Secured Climate Storage | Spring, Texas - Retail center located among the gated residential communities in Spring, Texas north of Houston's George Bush International Airport. Louetta Plaza is strategically located along the heavily traveled connector loop around the north Houston metro-area that connects the Hardy Toll Road with Interstate Highway 45. Phase 1 of the retail center is complete and leased and plans are completed for Phase 2 expansion with pre-leasing underway. Plans and engineering are also complete for Phase 3, which is being prepared for construction of a 4-story Secured Climate Storage, Spring building that is modeled after the Austin facility. 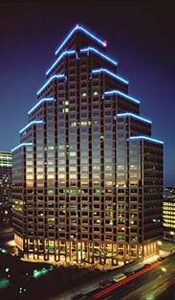 111 Congress Tower - High-rise Office & New "Gateway" to Downtown Austin | C&A privately planned and executed the land assemblage, redevelopment and revitalization of the new "Gateway" to downtown Austin and the Texas State Capital. Disgusted with the unsightly appearance and inappropriate land uses on five square blocks, C&A privately targeted this area as its redevelopment zone, encompassing Congress Avenue, what was then Town Lake and 1st Street, Brazos, San Jacinto and Trinity Streets. C&A assembled the ownership or controlling interest in each of those blocks for its new gateway redevelopment. C&A's vision was to replace liquor stores, seedy bars, tire stores, gas station, manufacturing business, dilapidated buildings vagrants sleeping on the sidewalks and alleyways, along with landmark businesses and responsible property owners such as the famous Matt's El Rancho restaurant, Salvation Army, University of Texas, the Thompson and Cherico families with four new highrise office and two hotel properties. The existing property owners all agreed to assist in the effort through the sale or relocation of their respective properties to Carpenter & Assocites to allow this important redevelopment to occur. C&A privately developed new design standards and "wedding cake" ordinance that would allow alley closures and taller buildings as a tradeoff for self-imposing building setbacks from Congress Avenue in order to open the view corridor to the State Capital and providing lushly landscaped plazas along Congress and First Street, full sized trees and waterfalls or art features. C&A recruited experienced highrise and hotel developers from Dallas to participate in this major $350,000,000 overhaul of downtown Austin. C&A and The Vantage Companies joint-ventured the development/ownership of the centerpiece to this master-project - the 30-story 111 Congress Tower, with 510,000 square feet of luxury office and 225,000 square foot retail parking garage. Lincoln Properties acquired the block on the west side of Congress from C&A and developed the other cornerstone for Congress Avenue, the 100 Congress Tower. John Carpenter III of Southland Financial and Las Colinas of Dallas acquired the two blocks along 1st Street fronting Town Lake and developed the San Jacinto Tower and Four Seasons Hotel project. The City of Austin and its taxpayers gained a major new tax base and economic development stimulator that continues to profit the community today. Westgate Tower - High-rise Residential/ Office Condominium Conversion | The iconic 26-story Westgate Tower, Austin, Texas, adjacent to the Texas State Capitol Building is the very epitome of the real estate adage, "Location, Location, Location". Charlie Carpenter financed the construction of this historic building for the Lumberman's Corporation in the mid-1960's as the Austin director for Prudential Insurance Company's Commercial Loan Division. Twenty years later, his son Jim, put together the investors to acquire the property for redevelopment and conversion to individually owned office and residential suite condominiums. Medical Park Tower - Mid-rise Office Condominium Conversion | This 7-story 147,000 sq.ft. building adjoins Seton Medical Center, Austin's largest medical /surgical acute care hospital. Medical Park Tower is home to most of the medical community that serves patients at this premier hospital. Medical Park Tower was acquired in 1986 for redevelopment and conversion to privately owned office condominiums was completed in 1987. Luxury Residential Condominium Conversion and Sales | Acquisition and redevelopment of three luxury apartment projects from 1979-1983. These projects were converted and sold as 1,000+ luxury residential condominiums. Regional Shopping Mall Developments | South Texas and Rio Grande Valley area regional shopping malls, 350,000 square foot El Centro Mall, McAllen Texas, the 140,000 square foot Southgate Mall, Kingsville Texas, the 261,299 Plaza Del Sol Mall in Del Rio, Texas. Each of these projects became their respective centers of commerce within their region. Retail Shopping Centers | Numerous Safeway and other grocery/drug chain anchored neighborhood and local retail shopping centers statewide. C&A developed their own portfolio of shopping centers across the state and assisted other national and regional shopping mall and center developers with their respective land acqisitions and property entitlements. WildHorse Ranch, Manor/Austin, Texas | formerly Texas A&M development foundation owned this tract, donated by Col. George Eppright, This 2,000+-acre property was originally master-planned by Jim and Richard Mathias of the Mathias Company in 1984. ShadowGlen General Partner, P. Dwyer acquired WildHorse in a limited partnership venture, established a P.U.D. agreement with the City of Austin for services and re-planned the property to accommodate the Texas 130 Tollway, Braker and Palmer Lane extensions to traverse the property. WildHorse was entitled and Dwyer negotiated the sale of the project to out of state development interests. The 400+ single-family lot WildHorse Creekside residential section located within Manor, Texas's city limits is built out and the WildHorse Commercial Section continues its retail development and sales. Whisper Valley Ranch, Manor/Austin, Texas | This 748 lot single-family subdivision was entitled for urban utility services. 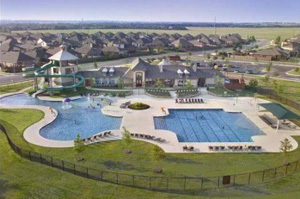 Located on Taylor Lane 3.5 miles southeast of Manor, Texas, Whisper Valley has hilltop views of the Austin skyline, a central forested park area and extensive system of waterscaped constant-level ponds provide an unparalleled community setting and value in an affordable price range. 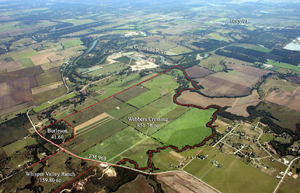 The project is located adjacent to the 272+ acre Travis County Northeast Metro Regional Park. The park's facilities include 11-lighted soccer and all-sports fields, 9 baseball/softball fields, basketball and volleyball courts, three catch & release fishing lakes, extensive walking, bicycle and hiking trails and disc golf. Travis County agreed to allow direct pedestrian access gate from Whisper Valley Ranch into the park. This project was sold to the Taurus Investment Holdings, a European funded Development Company Development and the initial phase of construction is currently underway. Whisper Valley (Stone Lake) Ranch, Austin, Texas | Jim assembled, acquired, planned and entitled this 1,710-acre master-planned community that will feature a master waterscape theme of lakes and "falling water". This project was combined with the Whisper Valley Ranch project, and sold to the Taurus of Texas GP headed by Douglas Gilliland, a U.S. investment/development company of Taurus Investment Holdings, a European based global investment company. Development began in March 2014.
Business Industrial Park - Dessau Business Park, Pflugerville/Austin, Texas | This project is a 123-acre master-planned deed-restricted development offering fully entitled business sites for smaller service and industrial businesses. This deed-restricted business park includes, landscaped water quality/drainage and pond facilities in a parkland setting and requires solid sight-barrier fence screening around all yard areas. Immanuel Plaza, the final retail phase, is under final development permitting at the corner of the intersection of Immanuel Road and Howard Lane. Major Industrial Business Redevelopment, Austin, Texas | Jim (CAJE, Inc.) purchased the former Celis Brewery in Walnut Business Park from Miller Brewing Company in early 2002 as part of a three-way exchange between Aus-Tex Printing & Mailing and the Austin Ballet. The Brewery underwent major demolition, equipment removal, redevelopment and conversion for Aus-Tex's printing and mailing plant facility, and accompanying executive business and sales offices. Aus-Tex's existing downtown headquarters at the intersection of 2nd & San Antonio Streets became the new home for the Austin Ballet. Past Founder and Chairman of the Northeast Association | Jim, conceived, founded and recruited public and private interests to form this regional non-profit organization, representing the 260+ square-mile Northeast Travis County area. Frustrated with the lack of attention given by the City of Austin and Austin Chamber of Commerce to the areas east and northeast of Austin, he sought to unify and concentrate private owners and resources to achieve accelerated results in these areas. The Northeast Association was established to conduct master-planning for economic and infrastructure development for this region's future network of roadways water, sewer & stormwater drainage dry utility services, public parks, and successful major industry recruitment (new Regional U.S. Post Office, Applied Materials, UPS, Samsung, etc). The NEA's non-profit operations were supported by private capital funding through annual membership dues by area property owners, industries, businesses, and area residents. Other NEA Board and Ex-Officio members included designated representatives from each of the area's city councils (Austin, Pflugerville, Manor and Elgin), area school district Superintendents, 2-area Travis County Commissioners, and the area State Representatives and State Senator. The City of Austin adopted a Resolution on August 22, 1985 expressing its appreciation and encouragement for the NEA's efforts in the City's goals for comprehensive planning for this region east of Austin. The success of the NEA was a factor resulting in the formation of the Greater Austin Area Chamber of Commerce with local area councils to represent their respective area interests. Past Chairman of the Biomedical and Pharmaceutical Committee for the Greater Austin Chamber of Commerce | One of twelve committees created to impanel local industry representatives and business experts in that field to travel, contact and recruit international and national industries for expansion to or trade with the Austin region. Jim recruited and assembled his board members from University of Texas School of Pharmacy and Chairman or Presidents of major drug and pharmaceutical companies in Austin. 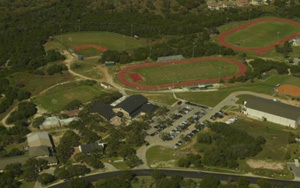 Founder and Vice-Chairman of St. Michael's Academy | Jim helped found and lead the private acquisition, development, construction activities, and operations for this 400+ student private college preparatory high school supported by the Austin Catholic Diocese. He was responsible for site selection, acquisition, securing utility and development permit entitlements, supervised the design and construction of buildings and facilities, assisted with project financing & community fundraising, served as Vice-Chairman of the Board of Directors assisting in financial oversight of school operations, hiring administrative, teaching and coaching personnel, active as parent volunteers including he and his wife Robin's efforts with student and school activities, events and expansion of athletic stadium and parking facilities conducted by school parents and contractors. Creator/Developer of Travis County Municipal Utility District #2, Cottonwood Creek W.C.I.D. 's #1, #2 and #3 | These Municipal and Water Control and Improvement Districts were established to assist in the development and provision of urban levels of utility services to facilitate growth in Manor, Texas and northeast Travis County. These Districts, with the private capital provided by the developer, accomplished the intended goals in providing new supplies of potable water, sewer and stormwater drainage improvements that have led to the explosive growth of Manor, Texas. Board of Directors Member for Stewart Title Company (Gracy Title) of Austin (since 1985) | Texas based International Title Insurance and Information Services Company. Presently an Advisory Board Member. Past Vice-Chairman of the Austin Rehabilitation Center | A community service provider to the City of Austin, Travis County and State of Texas MHMR and other service agencies in providing non-profit detoxification, treatment and rehabilitation for the drug and alcohol dependent. Jim served as Vice Chairman of the Board and headed the acquisition of land and a multi-family apartment project from federal government entities for the expansion of ARC's facilities. Jim oversaw the property entitlements, development approvals, design/redesign and/or development or redevelopment of these properties into certified treatment centers and facilities for the Austin Rehabilitation Center system. 1985 Texas Legislative Session | The assemblage of over 4,000-acres in northeast Travis County, beginning in 1981, required the independent exploration, development and operation of private municipal water, wastewater and storm water drainage facilities. This undertaking was completed in 1984 and the City of Manor was provided with its first publicly approved municipal supplies of water without any capital investment from the city. This endeavor provided the northeast Travis County sector with its first municipal supplies of urban-level utility services though private capital investment initiatives. The advent of the area's first successful private utility development brought rural water supply companies and the City of Austin into competition over service area boundaries. Jim sought legislative assistance to level the playing field and amend portions of the Texas Water Code to enable the creation of Regional Planning and Implementation Agencies. These quasi public/private ventures allowed municipal entities to provide sponsorship for a regional utility service plan, to establish service boundary controls, and the surrender of service areas of rural water companies that could not also provide wastewater. This legislation enabled the municipalities, utility districts and development interests the opportunity to bond together under regional utility agreements to provide comprehensively planned urban levels of services in rural areas. 1995 Texas Legislative Session | With the leadership of Senator Gonzalo Barrientos, Jim assisted in the effort to regain property rights and restore land values for landowners in the Manor, Texas region. Legislation was drafted, introduced, lobbied by Jim, and passed in the 1995 Texas Legislative Session that allowed relief for private property owners that were adversely impacted by the City of Austin's failed 7-year long condemnation actions against thousands of acres near Manor. Austin used arbitrary strip extensions of its city limits in order to extend its Extra-Territorial Jurisdiction an additional 5-miles to claim control over Northeast Travis County. The intent was to adversely impact area landowners by imposing regulatory controls over their property, limiting property owners' land uses and development options, in order to constrain the values prior to initiating condemnation. Over 400 property owners, including the Carpenter family holdings, were trapped by Austin's imminent domain proceedings for more than seven years extending into the nation's 1980's Banking and Savings and Loan crisis. 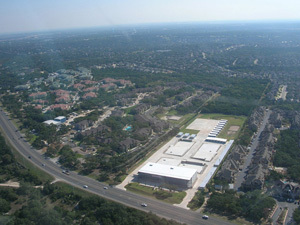 As lenders were closed or taken over by the FDIC or RTC, loans canceled, mortgages were called and large numbers of bankruptcies, foreclosures, and evictions were caused in the Manor area because these properties could not be developed, refinanced, sold, or leased because of Austin's pending condemnation. Jim assisted in drafting and lobbying for Senate Bill 1397 that was passed by near unanimous approval of the Texas Legislature and signed by then Governor George Bush. He had earlier obtained executed powers of attorney from more than 400 of the area's 413 affected property owners to represent their property and interests before the Texas Legislature and subsequently negotiate their legislatively forced release from the city of Austin's ETJ. Jim negotiated a release of Austin's regulatory control from the Legislature's mandated 9,000±acre area to include nearly 20,000 acres of Northeast Travis County. Senator Barrientos and Representative Dawnna Dukes provided crucial leadership that led to passage of SB 1397 and the exceptional growth and new job opportunities that arose in Manor, Texas and northeast of Austin.